BetSoft Gaming, the 3D slot game developer, has released Rook’s Revenge. 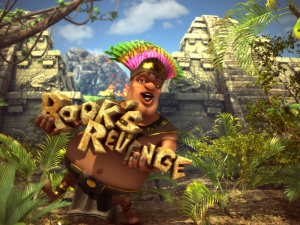 Rook’s Revenge is a 5 reel, 25 payline game starring The Chief, an overweight Aztec who thinks he is Patrick Swayze from Dirty Dancing (though he looks more like Chris Farley’s Saturday Night Live imitation). The symbols include familiar Aztec icons and faces. Match 3 Golden Masks and you win 10 free spins. The most exciting feature of Rook’s Revenge is Exploding Symbols Multipliers. Winning symbols explode in front of your very eyes. You can earn up to 4 explosions. The 4th explosion is worth a x5 multiplier, unless you’re in free spins mode – in which case you have a x15 multiplier on your hands! The coolest part of Rook’s Revenge is watching Rook do the dance! He has a bunch of different dance routines that accentuate his oversized belly. It looks like Rook has been eating too much Aztec junk food! Every winning spin is worth more than just money – you get to see Chief Rook perform one of his favorites dances routines. He sure knows how to move his oversized stomach! If he doesn’t go on a diet, they’ll have to bury him in a piano box. BetSoft has built quite a reputation for creating 3D slot games that attract gamers and newbie slot players alike. The graphics are immersive and you’ll feel like you’re in a 3D movie. The sound is quirky and funny. Look for Rook’s Revenge at your favorite online casino!